This Certified Professional Organizer was participating in a direct mail postcard campaign to high-end residents in Manhattan’s Upper East Side. The challenge was to make her postcard truly stand out, as it would be one of several packaged and sent in the same envelope. We used brief bullet points and emotional “trigger” words that really hit home with the audience. 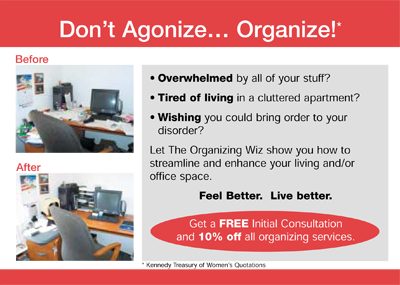 We also suggested using “before and after” photographs to show the results of her organizing services. The campaign was a success and netted a 64% return on investment!